The World Famous Pub Quiz™ returns to Insomnia! Enjoy rounds of general knowledge, gaming trivia, gaming music and more in this adults only fun filled evening of community antics that one guy in the survey once said was “a bit much”. And not only that, The World Famous Pub Quiz™ is proud to support our partner Special Effects. Get your team ready and remember, winners don’t use phones. So to round up: Trivia. Charity. Nonsense. Singing. Are you drinking yet? Get your pub quiz tickets here! 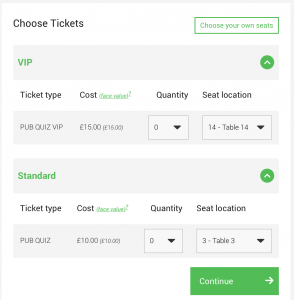 After clicking on the option to buy tickets you will be met with a screen layout of the Pub Quiz hall. From here you can zoom in and decide what seats you would like to choose. 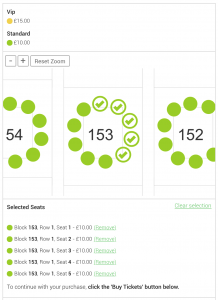 Click on the seats you would like to pick and a sub-total will begin to tally up under the box. Once this is complete you can click “next” to purchase your tickets! On this screen you’ll be able to pick how many tickets you would like; either in VIP or standard. Then you will be asked to choose what table you would like to sit at based on what is available for the amount of tickets you have requested. Finally, the seat picker will give you an overview on the best seats available for you.